After my solo show of assemblages and mixed media works a year ago, I felt tired of the mess and bother, the glue and little bitsy pieces of stuff, and decided to return to painting and drawing, focusing on technique and simple subject matter. The decision was aided by the fact that it was winter, and my “mess” studio, a closed-in garage, gets very cold…and is expensive to heat. I set up a working space in my “clean” studio (which isn’t all that clean but at least doesn’t have paint on the floor) – the “family room” of my house. And I started taking classes with Manhattan/Woodstock artist Chris Gallego, whose work I have greatly admired since first seeing it at his solo show at the WAAM. (See his art at http://www.chrisgallego.com). 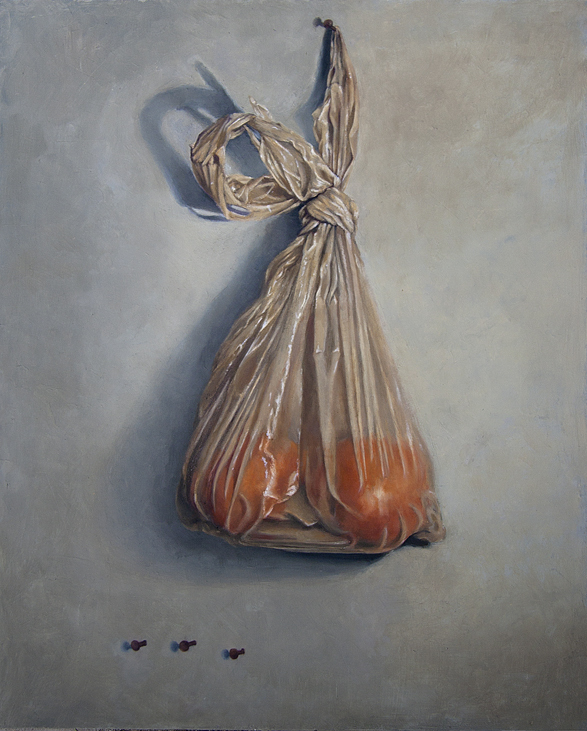 I painted still lifes, something I’ve never done before, and found it completely engrossing, especially under his expert tutelage. 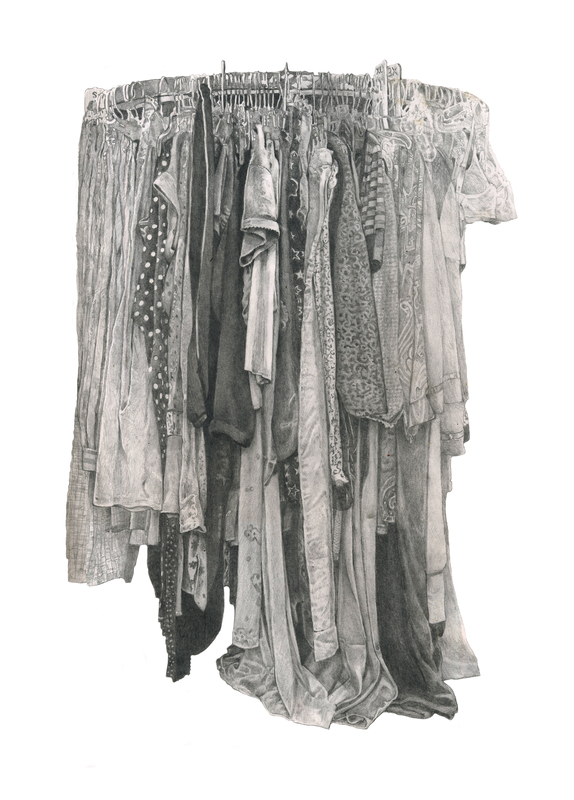 After an arduous painting of a plastic bag, pencil and paper called to me and I’ve now started a series of drawings…below is the first one, the subject of which is a rack of old clothes in a vintage shop in Virginia. I’m obsessed now, seeing drawings in everything. This coming weekend I’ll be doing an intensive 2-day workshop in Chris’s Woodstock studio, and I can’t wait. It’s always surprising to me how very much more there is to learn about even the “simplest” art techniques, and how much I don’t know. 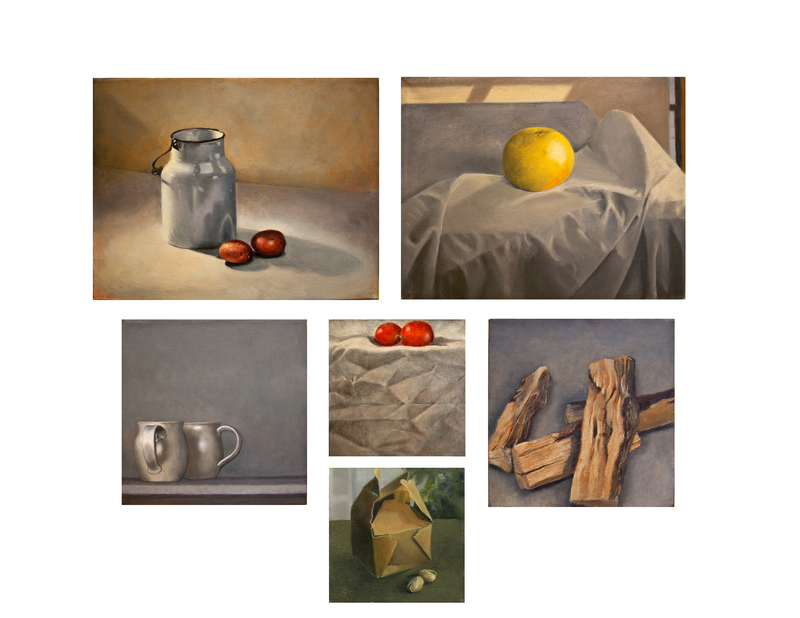 A few of my new paintings follow the drawing. I’ve sold two, and one will be in NAWA’s “Vernissage des Femmes Artistes” show in Miami during Art Basel week. It was my birthday, bitter cold and snowy in Illinois. My daughter was in surgery at St. Francis Medical Center in Peoria, and her husband and I had some nervous hours of waiting to do. 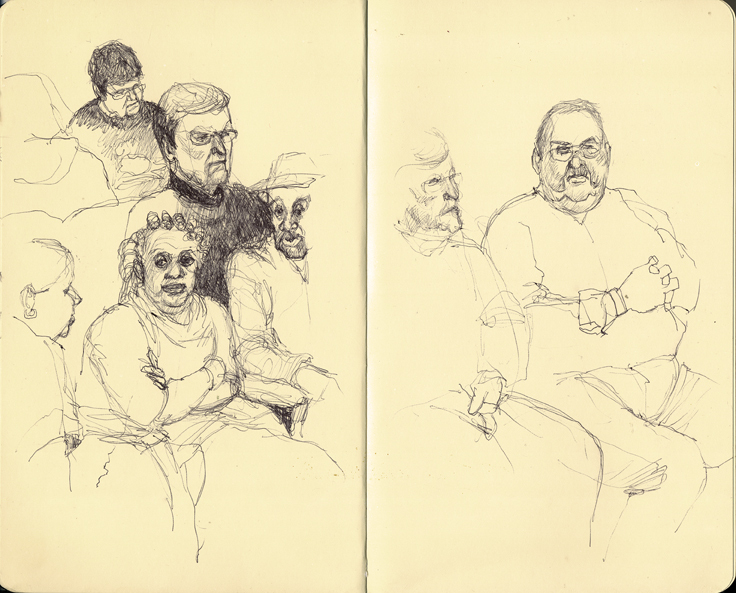 Sketch models were abundant, so I passed the time scribbling away while he worked on his laptop. Overheard while I was working on these pages: “…and there was so much blood on the floor, I thought, man, this boy is dead….almost cut his whole arm off…locked her in the basement with the dog.” Well, I’d love to know more about that story…. 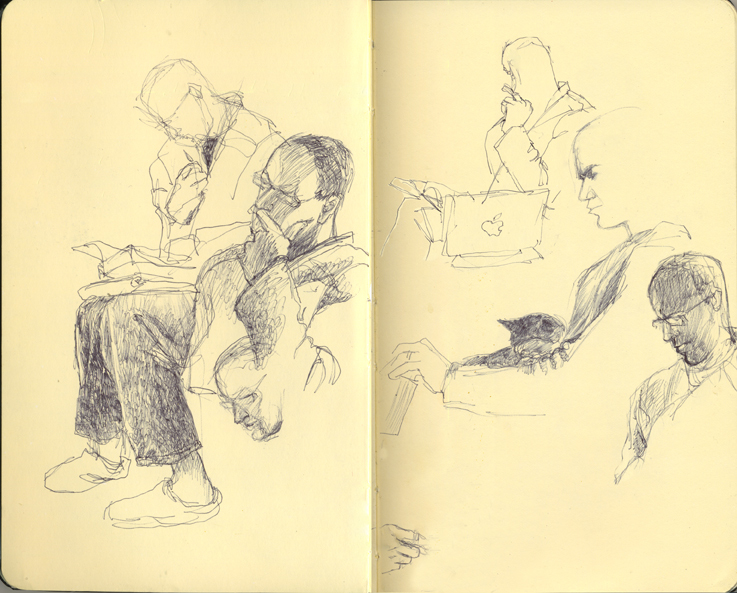 Next pages in sketchbook: Son-in-law studying, with cat Solange…. Wow, I hadn’t realized how very LONG it’s been since I did anything here…I started a blog for the Woodstock Artists Association and Museum (www.waamblog.wordpress.com) and when I got busy keeping up with that, I let this one languish. And…I’ve never felt anyone was really that interested in my daily comings and goings. My photographer friend Sue suggested I post pages from my sketchbooks, so I thought I’d go with that idea for awhile…sketching is pretty much my favorite thing to do. 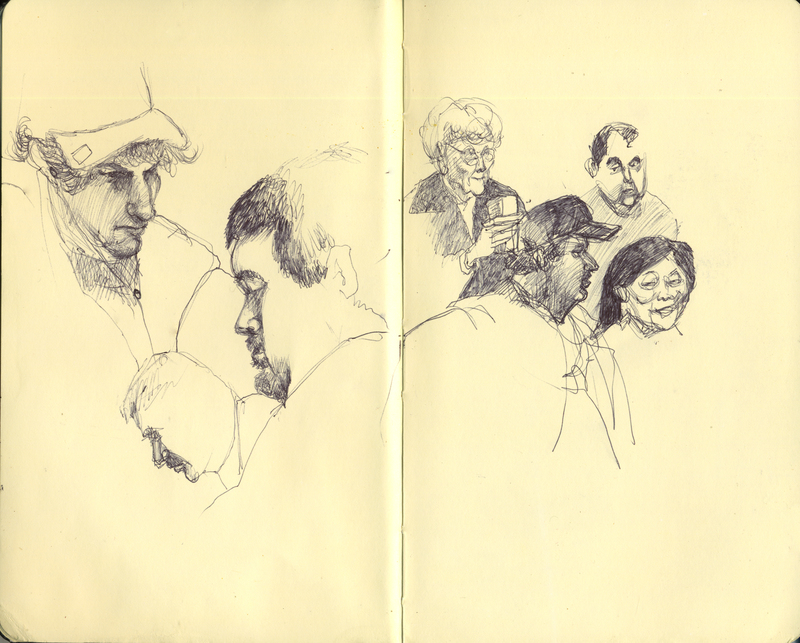 I’ll start with pages, a pair every few days if I’m not too lazy or busy, from my current Moleskine book. I love these sketchbooks, with their solid binding, smooth heavy creamy pages. I use a ballpoint pen almost exclusively…love the way it flows across the paper, the variations in texture and line I can achieve without worrying about pencil sharpening and smudging.